Bastion is an action adventure-RPG with a platformer aspect developed by Supergiant Games as the studio’s debut title. The game was released on July 20, 2011 on the Xbox Live Arcade, and then on Steam on August 16, 2011. 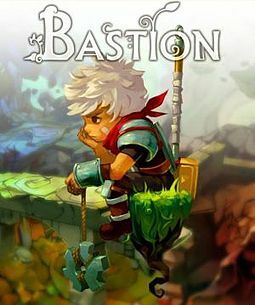 Even before its release, Bastion received a lot of praise, both for its story and gameplay. In Bastion, you play as “The Kid”, a white haired boy waking up after an event known as “The Calamity”, scattering the world into broken pieces. While adventuring to put the world back together, you’ll meet a few characters, all of which will be very memorable, that much I promise. I’ll stop here as to avoid ruining the story, but needless to say, it’s really great. The gameplay within Bastion is based on a top down isometric point of view where “The Kid” is centered on the screen. Throughout the world, you’ll be fighting many different creatures, ranging from little squirt-like entities, to birds, to man-eating plants. To help you through all of this you can return to the titular “Bastion” to equip weapons and special abilities. There are many different weapons to choose from, ranging from a Hammer to a Mortar. The gameplay is fluid and fast paced, due to the fact that you can have two weapons of your choice equipped at any time, allowing you to flow from a close up and personal brawl to a quick long ranged shot from a gun. Bastion also allows you to dodge your way out of attacks, which allows for the fast gameplay to be fair, yet challenging. “The Kid” also has a shield equipped at all times, which allows you to block incoming attacks as well as reflect them back at your enemies, causing them to be stunned or killed, given that it is timed properly. This shows that the game really rewards timing and skill. However, you will have to dodge, block, reflect, and attack all while trying to stay on your floating piece of rock. If you fall, you’ll take minor damage and be stunned allowing creatures to prey on your helpless body. Bastion also features two consumables, a health tonic, which functions as a health potion, and a black tonic, which allows you to use your special skill, such as throwing a grenade, or laying down a mine. Many players will eventually learn to store away their black tonics for future use, instead of binge drinking your tonics. The upgrade system in Bastion, while not in-depth, certainly allows for customization of the weapons at hand to fit each player’s needs. The upgrade system is as so: get a piece of upgrade material, acquire enough currency to upgrade it, and then pick one of two upgrades you wish to apply. After the weapon has been upgraded, you can freely switch between the two choices. This allows for the player to switch between them as needed, so as to not lock them in a position where they would rather not be in. This upgrade system is also fun to play around with because you can see the varying effects of the upgrades on the weapons and find the combination that best fits you. While some are mundane like “+5 to damage”, some are fun and interesting, while being useful such as “Seeker missiles on the rapid fire gun.” These are all balanced in accordance to the game, with nothing feeling overpowered or being a must have, which gives the play a choice of how they wish to shape their character. Bastion features a spirits system which allows you to give small buffs to “The Kid” such as the ability to shoot out needles when attacked, the ability to have health potions restore you to full health instead of only recovering a bit. and so on. There are many different combinations of spirits with more being unlocked as you progress through the game. All these allow for more in-depth gameplay and allow for customization based on your play style. Do you like to get in there and start swinging? Well then, take the spirits that lets you do just that. Bastion also features a shrine system, allowing you to augment and upgrade your enemies, making them move faster or hit harder. You’re probably wondering, “Why would I ever do this? That’s stupid!” but in reality, by enhancing your enemies’ skills, you will gain more rewards and experience, allowing you to improve as the game progresses. Bastion is based on the idea of improvement. You’re trying to improve the titular Bastion, and return it to its old form. You want to improve your weapons so as to make life easier. You want to improve your character so you can have a higher health pool and have more black tonics and spirits available, so why not improve your enemies as well to give you more of a challenge? There are also challenge maps allowing you to test your skill. There are two different types; one based on a specific weapon and another that’s similar to a horde mode. These can be accessed on the mission selection screen and be played to perfection so as to unlock certain things. The better you perform with the weapon, the better your reward is.These challenge maps also allow you to test out your new weapons and acquire a feel for them. The second type of challenge maps are those with waves of enemies and constantly collapsing terrain. These maps allow you to test out different combination of weapons and your own skill. While fighting waves of these creatures, you’ll be learning about the backstory of one of the characters, allowing players to create a connection with them. Bastion’s world is not static, instead opting for a world that forms around you with every step. This is both interesting and fun but also somewhat frustrating. While it is neat that every time you take a step the world forms just a bit more, you never know exactly where a path may form or cut off, and thus can miss a lot because of this mechanic. This highlights how the story and gameplay interact. You would not expect the world to be whole after a calamity, and it isn’t. It’s reforming and changed because of your presence, allowing you to feel as though you’re doing something useful instead of randomly going about your business. This makes the game world feel alive and vibrant allowing you to really feel the loneliness as well as providing a sense of hope that maybe the world can be fixed. Your starting point, Have fun! The world of Bastion shows a conflict between the Caelondians and the Ura. The Caelondians represent the west, with old timey Saloons and cowboys, marshals and walls, where the Ura are believed to represent the east, with spices and such. The contrast in the two nations are actually relatable because they represent two distinct ideas, and the fight between the east and the west are well documented itself, therefore this conflict seems real and relatable. Bastion’s story is also an interesting one because whereas other stories will have a lot of exposition to explain the new and bizarre world they’re currently in, Bastion takes that idea and twists it around. Instead of being told all of this by a party member or a NPC, you’re constantly followed by a narrator who will tell you about the world of Bastion: its characters, creatures, and their interaction. The narrator will also occasionally comment on how you’re doing during the game. This allows for the gameplay and story to take place at once. There’s no written dialogue per se in Bastion, instead the story is told through the environment and small remarks by the narrator. This all comes together to make a truly believable and live world. The inclusion of the narrator makes Bastion a really unique title and allows us to explore the story in two perspectives, one as “The Kid” and another one as “The Stranger”, who takes on the role of the narrator. It also helps that the his voice is one of the best known to man, with a gruff old-timey voice allowing him to feel western, really fitting his character and the world as a whole. The music in Bastion is something out of this world, being a techno-mash up between two distinct styles, with banjos and guqin’s coming together to create a really unique sound. The sound of Bastion has a consistent tone, with a rapid rhythm and great instrumentals. The music really fits into the story as well because you can see the sound of the two cultures in the story. It also helps that the soundtrack is amazing; quite frankly, I could listen to it the whole day and still feel fulfilled. Bastion also has a unique graphics style: a three dimensional cartoony look that really makes it stand out and be instantly recognizable. The style also fits well into the world, the aesthetic of Bastion allowing for the developers to use the isometric point of view to create an interactive world. Due to the art design, they can create fantastic creatures and architecture. The art comes together when you see the differences between creatures; each “species” look distinct and therefore are easily recognizable in a hairy situation. The art does not interfere with the game at all, in fact I believe it enhances the game with its visually stunning cartoony look. Concept Art, Not representational of the product but it's damn pretty. Bastion is a great experience, with a truly unique story and presentational manner. Not only is it interesting and innovative, it’s also fun, fast, and action packed, really capturing your attention and blurring the line between story and gameplay. Bastion is an incredible game with nothing quite like it. You can easily sink an entire week into Bastion and come out not regretting a single thing. The story is perfectly woven, creating an emotional roller-coaster that made me actually tearful by the time it was done. This perfectly designed game will only set you back $14.99 on Steam and $24.99 for the soundtrack version which in my opinion is well worth it. Bastion is such a well-designed game, with great visuals and gameplay. It’s truly a unique experience and I believe everyone should try it out. You can get Bastion from Steam.